Here in the blogger world there are always a few people who respond to what I write. I am very grateful for this. It keeps me going. I mean I would like to continue writing anyway but getting some kind of response helps a lot in actually proceeding with it. When I write about my experiences during war time and after the war, people instinctively respond in proclaiming their thoughts upon the horrors of war. Undoubtedly the horrors of war are immense. I know it, just about everyone has some inkling about it. It may sound strange, but I always had the feeling that I personally escaped real horror. Did I experience hunger? Real hunger and starvation that resulted in problems with health? I don’t think so. When I hear stories from people who were absolutely starved, it makes me feel terrible. Why did my Dutch-Australian friend, who was about the same age as I was during the war, why did she at times have to go absolutely without food in Holland whereas I had in Germany always a little bit to eat? It is just not fair. War is not fair! During the war the Nazi propaganda machine constantly bombarded us with slogans how we as Germans had to believe that we were going to win this war. We all had to work towards the ‘Endsieg’ (the winning at the end). By 1944 hardly anyone I knew still believed that Germany could win the war. My grandmother was the exception. She expressed an unshakable belief in the ‘Führer’ (Hitler). For this she was ridiculed by the family. She believed stories about the ‘Wunderwaffe’ (wonder weapon) which would save us. More and more everyone talked about it how they wished an end to the war. All our lives were put on hold so to speak. And this went on for quite some time after the war too. Schools were closed a few months before the end of the war. Where I was I couldn’t go back to school until four months after the war had finished. My eighteen year old cousin couldn’t go to uni as she had planned. She had to work in a munitions factory instead, getting up at five o’clock every morning to travel by train to her place of work. I heard everyone saying to continue with the war was madness. But still everyone seemed to go on doing what they were supposed to do. Even the bomb raids generally didn’t effect people’s behaviour very much. I mean most people went on doing what they had to do bomb raids or not. Amazingly a lot of foreign workers seem to have helped Germany by doing a proper job. For which after the war the Russians I believe handed out punishment. It is said that they treated their own people badly if they found out they had ‘co-operated’ with the Germans. However during the war years the Germans would send anyone who hindered the war effort away to concentration camps. Probably executions on the spot were not unknown either. During the first days after the war the Russians took everyone who looked like he could have been a soldier away. A lot of these men were never seen again. They may have ended up in a work camp in Siberia where starvation was rampant. No doubt about it, Germans had a hard time during the first post war years. But still it was an end to fighting. There was a future without any war. Everyone could live in peace. Peace, peace, peace, this is what we wanted. We were very relieved that the war had ended. Tough times, yes, but at least there was no more war. We could concentrate on peaceful things. What a relief. What hope for the future! Submitted on 2013/06/10 at 12:12 pm | In reply to auntyuta. Still, I can’t imagine what that must have felt like to those former believers. A bit like having your priest turn into a mass murderer. Was it you who suggested to me the book , The Shame of Survival? It’s interesting to read how a young girl came to recognize that she’d been duped. Reply by Uta: We had the feeling we had all been duped, Linda. Over time most of former ‘believers’ had already changed their mind long before the war had actually ended. When you hear of all the atrocities later on of course you feel guilty then, guilty by association even if you were only a kid. I can’t help but feeling weary of all kinds of propaganda and indoctrination throughout my life. This kind of feeling of being duped never leaves me! Linda, I think towards the end even my grandmother didn’t believe in the ‘Führer’ any more. Germany was well and truly defeated. I think Germany learned its lesson from this. Submitted on 2013/06/10 at 10:49 am | In reply to gerard oosterman. The big lesson for me in Australia was, that people from other countries CAN live together. Australians are not totally free from racism and prejudice but it has a much milder form as they don’t feel so much under pressure as people who live much closer like in Europe. Luckily the bad times in Europe are over. People that go to another country are not necessarily the terrorist but they are the ones that want to avoid conflict. A decent job and income is foremost on their mind once they have arrived. Give them a chance and the will become valuable citizens. Acceptance of differences and inclusiveness might also be helpful in avoiding conflict. Break down barriers and learn to respect each other. Are fences between neighbours really necessary? Reply by Uta: Gerard, you ask are fences between neighbours really necessary? A very interesting question, indeed. I feel it’s possible to write a whole essay about it. My short answer would be communicate with each other while at the same time showing some respect for what is different in the other person. It’s good to feel included if this kind of respect is shown. Communication is good. But so is privacy. You need a balance, don’t you think? You mentioned Holland in your post. Food that was grown there, was taken out of the country by the Germans to feed their own people. I share your sentiments on war generally. Germany fares much better now trading with every other country and not making war and trying to conquer those countries. Personally, we were lucky being spared the experience of trauma. But hearing, after the war, of all the atrocities done in our name, gave a big shock. And now? We learn every day from the news that other people do atrocities too. It seems to me one can declare someone an enemy and, Bingo, everything is allowed that you can do to them. I think, of all the commandments “Love thy neighbour !” is the most important one. Having read once more a few of my blogs on childhood memories, I came to the conclusion, it might be best if I tried to put all these blogs about my childhood as ‘pages’ together in the one place, so I could find them more easily when I wanted to look something up. It would make it easier for my children too to read up on my childhood. For now I plan to first copy the relevant blogs. I’ll probably need a few days or weeks for this. As far as possible I might refrain from putting anything else in my posts. Just as well, for ‘news’ items, as far as politics are concerned, usually do not give me much pleasure. And personal news, well, I could probably catch up with them at a later stage. Towards the end of September 1943 we left Berlin to live in the country. We moved to a place called the ‘Ausbau’, which meant that eventually ‘more’ was to be added to the building.. It was a simple rectangular red brick complex with several entrances around the building. There was no plumbing or electricity. The entrance for us ‘Berliners’ was on the left side at the front of the building. We had a cellar, a ground floor and two upper floors. Mum, my two younger brothers and I, shared a bedroom on the first upper floor. We also had a small kitchen and a living-room. I would sleep in the living-room when my dad came home on leave. Two maids, one Polish, the other Russian, shared two rooms on the top floor. All the rooms on the top floor had sloping ceilings. Our Polish maid was in her early twenties. Her name was Maria. She was very efficient and always rather serious.. The T. Family, who lived on the ground floor, employed Katja, the Russian maid, who was only eighteen and extremely fun loving. 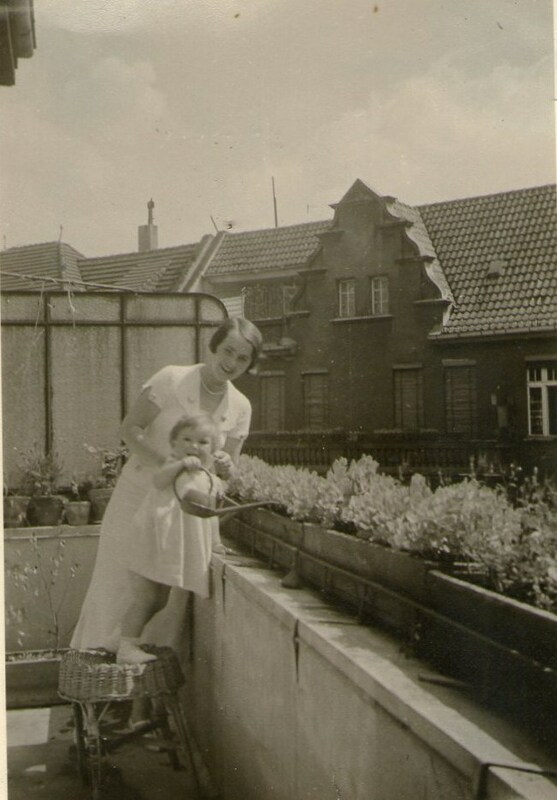 My mum’s sister, Tante Ilse, also had her rooms on the first upper floor. She had a bedroom and a living-room. On the ground floor, right underneath her upper rooms, she had a kitchen and a dining-room. She hardly ever used those downstairs rooms. Our friends from Berlin, the T. Family, occupied three rooms downstairs, namely a kitchen, a living-room and a bedroom, the same arrangement of rooms that we had on the upper floor. On the same upper floor right under the roof was a playroom, which my brothers and I shared with eight year old Edith T. There was another room next to the playroom where Mrs. T.’s parents had stored some bedroom furniture. The parents were Mr. and Mrs. B. and had a business in Berlin. 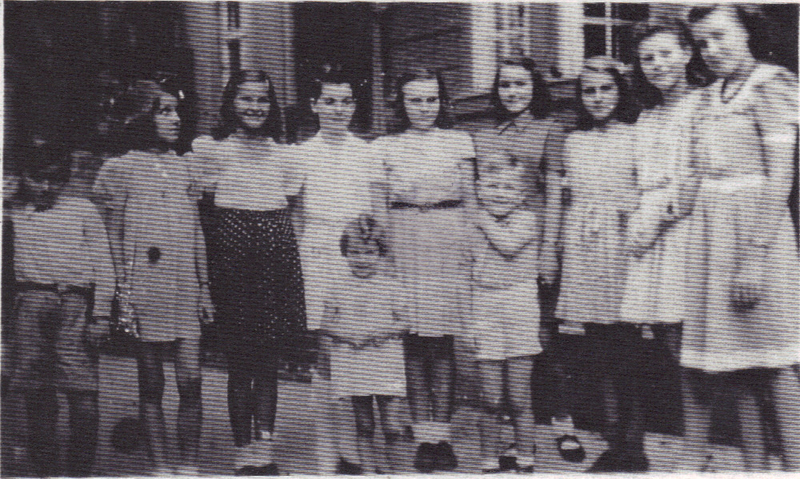 They sometimes stayed at the ‘Ausbau’ in that bedroom in order to be with their family away from the bombs in Berlin. Our toilets were “plumps-closets” some distance away from the house. Water for cooking and washing had to be fetched from a pump in the backyard. Fetching water from the pump kept both maids very busy indeed. For lights we had kerosene-lamps, for heating there were coal-fired stoves which could also be used for cooking. Everything was very basic. Gradually some changes were being made. The first big change was that our landlord had electricity laid on. All the workers who lived with their families in the other part of the building, received the benefit of electricity at the same time. This certainly was a very welcome improvement for them. The ‘Ausbau’ was built close to a dirt-track which meandered through wide open barley-, oat- and potato-fields. On the track it was a good half hour to walk to the next village. Bike-riding however made it a bit quicker. Werner M., the owner of all those fields that went on for miles and miles, was an acquaintance of Tante Ilse. He was apparently quite rich and also owned extensive brick-works (Ziegeleien). It was said of him that he was a millionaire. He was our landlord and he liked to spoil us. With no strings attached! Tante Ilse only had to voice a wish and Werner M. immediately did whatever he could to fulfill her wish. He spoiled us by constantly getting produce delivered to us: Potatoes, cabbage for making sauerkraut, wonderful treacle made of sweet-beets, and coal for our stoves. Even I, as a nine year old, could see that sixty year old Werner M. was hopelessly in love with Ilse. I also was quite aware, that she always kept him at a distance. He was happy to just be invited for ”Kaffee und Kuchen’ on weekends and to spend some time with all of us. He always came to visit on his bike. On his daily inspection tours of the workers in the fields he also went around on his bike. He owned coaches with horses, but hardly ever used these to go anywhere. Occasionally we were invited to his place (which people called ‘Schloss’), Then he sent a coach with a coachman to pick us up. Once in winter when there was plenty of snow, Werner M. sent a ‘Pferde-Schlitten’ (horse-drawn sledge). On this sledge we were wrapped up in blankets under a clear night-sky with the moon and lots of stars shining on us. It was unforgettable and one of the rare highlights in our otherwise pretty dreary country-life existence. The place where Werner M. lived, did not look like a castle at all, even though people called it ‘Schloss’. It was not even a mansion but a rather large, but fairly plain house. There was a huge, fenced in veggie garden next to the house. I have seen the veggie garden only once. However I was very impressed by it, because it seemed to be so very large. When we moved to the ‘Ausbau’, Ilse had already been divorced from her first husband. It was obvious that Werner M. would have liked to marry Ilse. However, it never came to that. 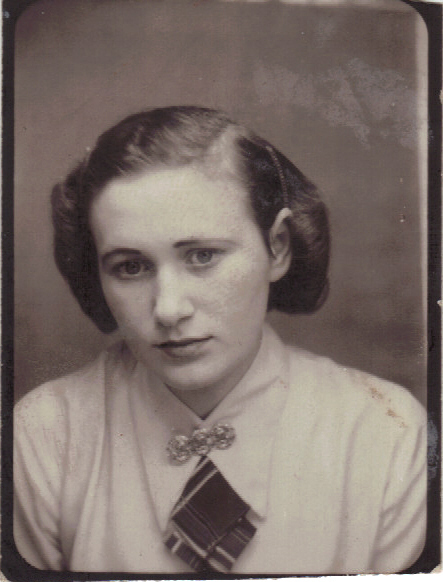 Tante Ilse married Onkel Peter aka Helmut L. on July 20th, 1944. It was a big thrill for me to go exploring among the furniture in that big storage-room, especially in the weeks before Christmas! Mum used to store lot of goodies during the Christmas season. It was very exciting for me to find out what new things had been stored in that big room. I remember seeing huge chunks of nougat (a yummy hazelnut-paste) as well as heart-shaped marzipan-pieces. There was a pot with sweetened thick milk. Sometimes I dipped my finger into it to lick this wonderful sweet stuff! I also liked to eat a few of the stored raisins and prunes! Smells of ginger bread and apples: It made me feel that Christmas was something to be looking forward to. Where on earth did Mum get all those things from? It was war-time, wasn’t it? We were in the midst of war! I knew very well where all this came from. The parents of Mrs.T. had a distributing business. It was called ‘Backbedarf en Gros’. That meant they delivered goods to bakeries and cake-shops. Even in the midst of war deliveries of the above mentioned goods still took place! Of course there were shortages, but basically most things were still available. Mr.T. and Mrs.T., as well as Tante Ilse and Mum were all good friends. Every Saturday night they came together for some card games. Eight year old daughterEva and I were allowed to stay up late on those nights. For hours we were watching the adults playing cards. At the same time we entertained ourselves with doodling on bits of paper. At around ten o’clock some cake and hot chocolate as well as coffee were served. But the maids did not have to do the serving, They were already in their rooms at this hour. The cake was usually freshly baked, very fluffy yeast cake topped with delicious butter-crumbs and filled with a thick custard. Hmm, yummy! Mr.T. always stayed in Berlin during the week, where he worked in the business of his parents-in-law. Being over forty, he was not required to join the German army. Mr.T. always brought some sweet goodies along when he came home from Berlin for the weekend. During the summer of 1944 Mr.T. and Mum liked to go on their bikes to a neighbouring Nursery where they were able to trade sweets for fresh produce. Eva and I were often allowed to go along with them on our bikes. The sweets were traded for strawberries or cherries or gooseberries as well as peaches and apricots, and later on in the year for pears and apples. I remember the Boskop apples were still in season in late autumn. The owner of the nursery was a well-off looking middle-aged woman who was very fond of sweets and loved to trade her produce. At one time we found out that she thought Mr.T. and Mum were a couple and we girls were sisters. Laughing joyfully, Mum and Mr.T. explained, that this was not so. Only once as far as I remember were we shown into the lady’s home. Mr.T. made complimentary remarks about the interior of the house. He said it showed off the owner’s good taste. I liked the lady’s house a real lot too. Our families used to have well furnished apartments in Berlin. But this modern looking villa in the midst of the nursery really was something else. My feelings were I would very much like to live in a place like that. However we had to be happy with our accommodation in the Ausbau. 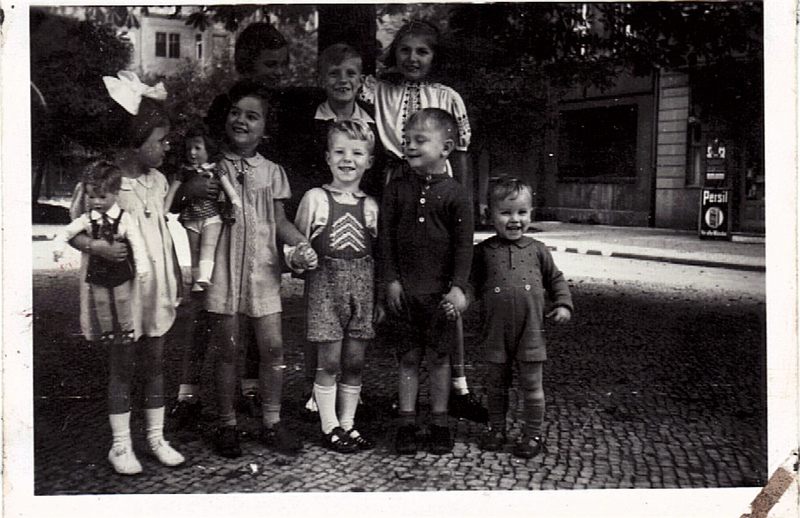 To us children it was always pointed out, to be happy that we did not have to live among the bomb raids in Berlin. I’m pretty sure that by myself I felt that I’d rather live in Berlin, bomb-raids or not. I think to children bomb-raids usually didn’t seem as scary as to the adults. At the time we children had had no experience yet how absolutely horrible these bomb-raids could become. In 1990, soon after the Fall of the Wall, I went with my family to have a look at the area where we used to be hidden away from the bomb-raids. We discovered that the nursery as well as the lady’s house had completely vanished. There was nothing left of the ‘Ausbau’ either! In 1943, when we had lived at he ‘Ausbau’ only for a couple of months, Mrs. T. delivered a healthy daughter in a regional hospital. The day after the baby was born, it may perhaps have been a Saturday or Sunday, Mr. T. and Eva went for the forty-five minute bike-ride to the Hospital. I was thrilled that I was allowed to go with them! The baby was rather tiny. I think this is why she was soon called Krümel (tiny crumb). Her given name was Ruth. Eva had a pet-name too. She was often called Honkepong. Nurse used for herself the bedroom next to our playroom. Sometimes she sat with us children in the playroom. Since Christmas was approaching, she taught us how to make some Christmas decorations. I was very impressed, because I was nine years old and nobody had ever taught me anything like it! Nurse also made sure, we learned our Christmas poems. We had to be prepared to recite them to Santa on Christmas Eve! Maria, our Polish maid, had been with us since before my little brother was born. He regarded Maria as his ‘Dah-dah’, that is he always called her ‘Dah-dah’. By the end of January 1945 we had to flee from the ‘Ausbau’ as the Russians were approaching fast. We went to Berlin first and then by train to Leipzig to stay at Grandmother’s place. Maria remained in Berlin with her Polish fiancee, who was a butcher. When we parted from Maria, little brother Peter had just turned three. Yet he must have missed her for quite a while since she had always looked after him and I am sure, he loved her very much and she loved him. Mum always trusted Maria, who was in every way caring and efficient at the same time. Mum was always impressed how quickly Maria worked. Any dirty dishes were washed immediately. She was indeed capable of doing all the housework. Mum was happy to let her do just about everything. An exception was the baking of a large cake on Saturdays, which Mum loved to do herself. Maria always made some potato-salad for the weekend. I watched how she did it. To the peeled and sliced potatoes she added finely cut onion, some oil, pepper and salt. Then she poured hot vinegar-water over the potatoes as a finishing touch. The huge salad-bowl was placed outside on a shelf near the stairway so the salad could cool down. I often helped myself to some of the warm salad when nobody was looking, because I loved to eat the salad when it was still a little bit warm. It was the same every Saturday. I watched Maria preparing the salad and placing it on the shelf outside. Then it did not take long before I had a good taste of it! Friday night was the night for our bath. Maria placed a small tin-tub on the kitchen-floor. She carried several buckets of water from the outside pump to the kitchen. Some of the water she heated on the kitchen-stove in an especially huge pot. I was always the first one to use the bath-water, then it was brother Bodo’s turn. Little brother Peter was always the last one. Some hot water was added for everyone, but still the water must have been quite dirty for little Peter after Bodo and I had had our baths! When Maria first came to live with us, she knew very little German. However she was determined to learn German quickly. She liked to ask Bodo and me how to pronounce certain words. She also asked me how to write these words in German. Mum often praised Maria, that she was willing and able to learn quickly. This applied to everything she did. She was an amazingly efficient person. A ‘pearl of a maid’ people would say of her. Maria was a city girl. She came from Lodz, which was called ‘Litzmannstadt’ at the time. We had spent the summer-months of 1941 at Zokolniki (near Lodz) and that was when Maria was assigned to us as a help. Mum liked Maria and wanted her to come with us when we went back to Berlin. Maria told me later that she did not want to leave Poland. But she had not been given the choice to stay in her own country. When Katja arrived, we could see that she was very different from Maria. She was a country-girl from Russia. She never learned German as well as Maria did. She could never be trusted to do all the house-work by herself. Mrs.T. always had to supervise her and do certain things herself because Katja took too long to learn to do it properly. But we all loved Katja. She was always cheerful and full of beans. As a country-girl she did not know certain things that a city-girl had been brought up with. Maria took to instructing Katja about certain things. I think they communicated in German. After they finished work in the evening, they had plenty of time to stay in their rooms together and keep each other company. Both girls always had to get up early. During summer, school-classes in the village started as early as seven o’clock. That meant, I had to get up at six o’clock to get ready for school. Mum never got up that early. But Maria always came down at six o’clock to start working for us. I experienced this country life nearly seventy years ago. It was very different from life in Berlin. Thanks for commenting, dear Catterel. I hope some of my descendants are going to find it of interest, Robert. Well, Emu, the memory can be quite shady. Some things we remember, some things we forget. We always seem to remember holiday times better than other times for instance. I think lots of things that have to do with how I felt at the time did get stuck in my memory. Maybe as a kid I didn’t often have a chance to really talk about my feelings. This is why I reflected a lot during the hours when I was by my lonely self. This reflecting came naturally to me. Nobody did give me instructions how to do it. When someone made a comment to me that stirred my feelings in some way, I would probably reflect on this comment for hours later on and never forget it. As a kid I seem to have analysed what sort of feelings certain persons gave me. When Katja arrived, we could see that she was very different from Maria. She was a country-girl from Russia. She never learned German as well as Maria did. She could never be trusted to do all the house-work by herself. Mrs.T. always had to supervise her and do certain things herself because Katja took too long to learn to do it properly. But we all loved Katja. She was always cheerful and full of beans. As a country-girl she did not know certain things that a city-girl had been brought up with. Maria took to instructing Katja about certain things. I think they communicated in German. After they finished work in the evening, they had plenty of time to stay in their rooms together and keep each other company. Both girls always had to get up early. During summer, school-classes in the village started as early as seven o’clock. That meant, I had to get up at six o’clock to get ready for school. Mum never got up that early. But Maria always came down at six o’clock to start working for us. She often had to do Peter’s linen early in the morning, which I am sure was not one of her favourite tasks. The death notice Peter found by googling Cordula’s name. It was in a church bulletin from October 2011. It was definitely a death notice for Cordula. It showed the correct spelling of her first name and double surname. I can’t imagine handling that many kids! Emu, thanks very much for your comment. I have so many memories about Cordula, going as far back as 1937, I believe. It’s kind of strange that there are big gaps when she wasn’t around because of the war. There were some beautiful years of friendship after the war. However she was in a different school year and had not the same friends that I had. Maybe Lieselotte, who was in my class, was the only mutual friend we had. Her Dad had died and then her Mum died too. This was when she moved away from Berlin to stay with her aunts in Stuttgart. Later on she lived in the Middle East. She wrote me beautiful letters. She had a good job. She married late in life. Had two children, sent me lovely photos of her family. She moved with her husband back to Germany. I only saw her once again for an afternoon visit. This was in 1986, such a long time ago! There’s so much I don’t know. Maybe there’s a chance to find out where Tilwin, her brother, is. The last we heard from him, he lived with his wife and two children in Düsseldorf. But this goes back maybe fifty years. Such gaps in time. I can only say that I always thought that Cordula was a very special person. Maybe I’m imagining things, but I believe she was filled with inner beauty. No, I’m not imagining this. This is how she was. I am sure she led a good life. You’re right, Emu, beautiful yet sad memories. Our toilets were “plumps-closets” some distance away from the house. Water for cooking and washing had to be fetched from a pump in the backyard. Fetching water from the pump kept both maids, Maria and Katja, very busy indeed. For lights we had kerosene-lamps, for heating there were coal-fired stoves which could also be used for cooking. Everything was very basic. Werner Mann, the owner of all those fields that went on for miles and miles, was an acquaintance of Tante Ilse. People said he was a millionaire. Apart from these Ländereien he owned extensive brick-works (Ziegeleien). He was our landlord and he liked to spoil us. With no strings attached! Tante Ilse only had to voice a wish and Werner Mann immediately did whatever he could to fulfill her wish. He spoiled all of us by constantly getting produce delivered to us such as: Potatoes, cabbage (for making sauerkraut), wonderful treacle made of sweet-beets, and coal for our stoves. Even I, as a nine year old, could see that sixty year old Werner Mann was hopelessly in love with Ilse. I also was quite aware, that she always kept him at a distance. He was happy to just be invited for ”Kaffee und Kuchen” on weekends and to spend some time with all of us. He always came to visit on his bike. On his daily inspection tours of the workers in the fields he also went around on his bike. He owned coaches with horses, but hardly ever used these to go anywhere. Occasionally we were invited to his place (which people called ‘Schloss’), Then he sent a coach with a coachman to pick us up. Once in winter when there was plenty of snow, Werner Mann sent a ‘Pferde-Schlitten’ (horse-drawn sledge). On this sledge we were wrapped up in blankets under a clear night-sky with the moon and lots of stars shining on us. It was unforgettable and one of the rare highlights in our otherwise pretty dreary country-life existence. The place, where Werner Mann lived, did not look like a castle at all, even though people called it ‘Schloss’. It was not even a mansion but a rather large, but fairly plain house. There was a huge, fenced in veggie garden next to the house. I have seen the veggie garden only once. However I was very impressed by it, because it seemed to be very large. When we moved to the ‘Ausbau’, Ilse had already been divorced from her first husband. It was obvious that Werner Mann would have liked to marry Ilse. However, it never came to that. Tante Ilse married Onkel Peter aka Helmut Lorenz on July 20th, 1944. Our part of the building had a huge storage room on the top floor. A lot of our furniture was stored there. I loved to go exploring among the furniture where Mum used to store a lot of goodies. Especially in the weeks before Christmas Mum used to store there a lot of stuff. It was very exciting for me to find out what new things had been stored in that big room. I remember seeing huge chunks of nougat (a yummy hazelnut-paste) as well as heart-shaped marzipan-pieces. There was a pot with sweetened thick milk. Sometimes I dipped my finger into it to lick this wonderful sweet stuff! I also liked to eat a few of the stored raisins and prunes! There were smells of ginger bread and apples: It made me feel that Christmas was something to be looking forward to. Where on earth did Mum get all these things from? It was war-time after all! We were in the midst of war. – However I knew very well where all this stuff came from. The parents of Mrs.T. had a distributing business. It was called ‘Backbedarf en Gros’. That meant they delivered goods to bakeries and cake-shops. Even in the midst of war deliveries of the above mentioned goods still took place! Of course there were shortages, but basically most things were still available. Mr. Fritz T. was in that business with his parents-in-law. This is why he stayed in Berlin during the week. But on weekends he left Berlin to stay with his family in the Ausbau. He usually was able to bring along some delicious Backbedarf. And apparently he was always willing to let my mum Charlotte have some of the goodies too. Mr.T., being over forty, was not required to join the German army. 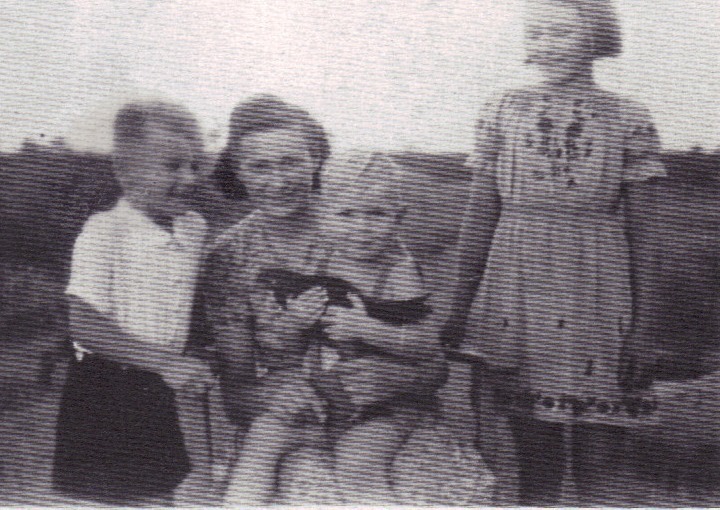 Mr. Fritz T. and Mrs. Edith T., as well as Tante Ilse and Mum were all good friends. Every Saturday night they came together for some card games. Eight year old daughter Eva and I were allowed to stay up late on those nights. For hours we were watching the adults playing cards. At the same time we entertained ourselves with doodling on bits of paper. At around ten o’clock some cake and hot chocolate as well as coffee were served. But the maids did not have to do the serving, They were already in their rooms at this hour. The cake was usually freshly baked, very fluffy yeast cake topped with delicious butter-crumbs and filled with a thick custard. Hmm, yummy! Only once, as far as I remember, were we shown into the lady’s home. Mr.T. made complimentary remarks about the interior of the house. He said it showed off the owner’s good taste. I liked the lady’s house a real lot too. 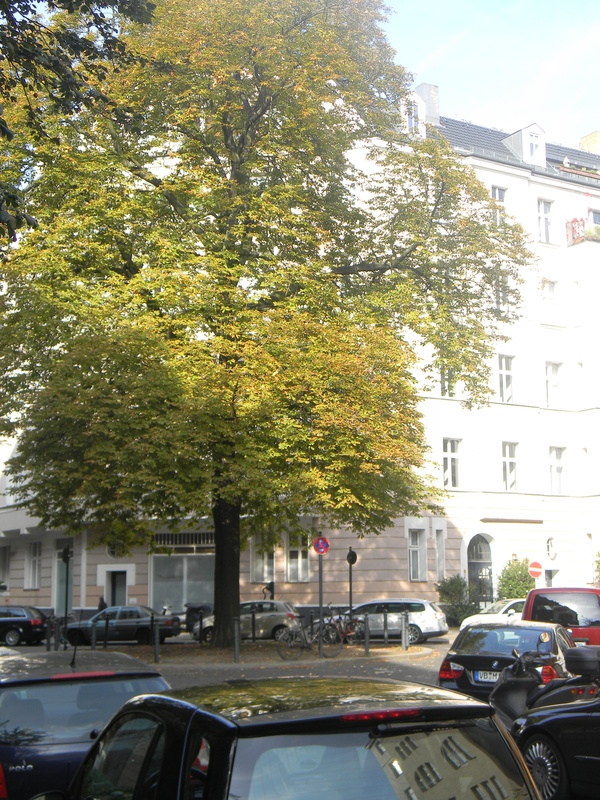 Our families used to have well furnished apartments in Berlin. But this modern looking villa in the midst of the nursery really was something else. My feelings were I would very much like to live in a place like that! However we had to be happy with our accommodation in the Ausbau. To us children it was always pointed out, that we should be happy that we did not have to live in Berlin where all these bomb raids occured. I’m pretty sure that by myself I felt that I’d rather live in Berlin, bomb-raids or not. I think to children bomb-raids usually didn’t seem as scary as to the adults. At the time we children had had no experience yet how absolutely horrible these bomb-raids could become. In 1990, soon after the Fall of the Wall, we went for a visit to Germany and had a look at this area east of Berlin where we used to be hidden away. We discovered that the nursery as well as the lady’s house had completely vanished. There was nothing left of the ‘Ausbau’ either! In 1943, after we had lived at he ‘Ausbau’ for a couple of months only, Mrs. T. delivered a healthy daughter in a regional hospital. The day after the baby was born, it may perhaps have been a Saturday or Sunday, Mr. T. and Eva went for the forty-five minute bike-ride to the Hospital. I was thrilled that I was allowed to go with them! The baby was rather tiny. I think this is why she was soon called Krümel (tiny crumb). Her given name was Ruth. Eva had a pet-name too. She was often called Honkepong. Maria, our Polish maid, had been with us since before my little brother was born. He regarded Maria as his ‘Dah-dah’, that is he always called her ‘Dah-dah’. By the end of January 1945 we had to flee from the ‘Ausbau’ as the Russians were approaching fast. We went to Berlin first and then by train to Leipzig to stay at Grandma Olga’s place. Maria remained in Berlin with her Polish fiancee, who was a butcher. Maria always made some potato-salad for the weekend. I watched how she did it. To the cooked, peeled and sliced potatoes she added finely cut onion, some oil, pepper and salt. Then she poured hot vinegar-water over the potatoes as a finishing touch. The huge salad-bowl was placed outside on a shelf near the stairway so the salad could cool down. I often helped myself to some of the warm salad when nobody was looking, because I loved to eat the salad when it was still a little bit warm. It was the same every Saturday. I watched Maria preparing the salad and placing it on the shelf outside. Then it did not take long before I had a good taste of it! I mentioned in this post our landlord, Werner Mann. He is here in this picture which was taken by Mrs. T. on Christmas Eve 1943. Werner Mann is on the left, on the right is Mr. Fritz T.
Tante Ilse is next to Werner Mann. together with cousin Renate. I am in the back with my doll. You can see me holding up one of my Käthe-Kruse-Dolls. Mum had knitted a lovely new dress for this doll. The children in front are eight year old Eva T. and my five year old brother Bodo. Next to Mr. T. is Mum and Grandma Olga (Mum’s mum) is on the left next to Werner Mann. This photo was taken in Tante Ilse’s livingroom. We were all sitting together for Christmas Eve celebrations. The photo is proof that my grandmother from Leipzig and cousin Renate were with us for Christmas 1943. In the weeks before Christmas Mum loved to do some sewing of clothes as well as a lot of knitting for us children. When she did this we were not allowed in the living-room because she wanted the gifts to be a surprise for Christmas Eve. That meant of course that we had to be very, very patient. Naturally we thought Christmas Eve would never come! Submitted on 2014/12/14 at 6:51 pm | In reply to swissrose. Thank you, dear Swiss Rose, for telling me about these interesting stories that you have read. No, I am not familiar with these particular stories. Since 1959 I have lived in Australia with my husband and children. This is why I blog usually in English. But we still have family in Germany and are always interested to hear more about Germany. We have also been visiting Germany a number of times. Submitted on 2014/12/14 at 6:17 pm | In reply to rangewriter. ” . . . . a time so far, and yet not so far away.” Yes, Linda, this would describe our feelings thinking back to it now. It is strange how some memories just stick with you. At the time Berlin suffered greatly under bomb raids that just did get worse and worse. All children had left Berlin by then. We all had to adjust to a life away from Berlin. I so enjoyed reading your memories of this time. My favourite book as a child was When Hitler Stole Pink Rabbit by Judith Kerr (who wrote several volumes) and my interest in the period continued, mainly because my grandparents’ (and GPs’-in-law!) stories always fascinated me, too. Your story reminds me a lot of some I have read by Lise Gast, who wrote pony and stories for children/teens which include a lot of autobiographical detail very like this; she was widowed just after the birth of her 8th child in 1945 and they were living on a Gut, in 2 rooms above a stable, having fled their home in Silesia; they had an “Onkel” who looked after them and helped Lise (a pseudonym for Elisabeth Richter, s. Wiki) to buy and house their first Shetland pony, delivered in a crate… the family went on to become pony pioneers in Germany in the 50s. Unsere Ponies und wir was one book and her daughter later published a biography called So war es, gut, dass es so war; there are also some lovely Christmas stories but they all have a lot of detail about daily life at this time before the Wirtschaftswunder. I wondered if you’d ever read any of these? I love these memories of a time so far, and yet not so far away. You describe them with such clarity, its as if I’m watching a film. And of course, I’m afraid, I’m imagining my own German relatives in the stories of your family, Auntyuta. They were in Berlin during that time also. Submitted on 2014/12/07 at 6:09 pm | In reply to catterel. Freezing temperatures in winter, oh yes, Cat, they were a problem in times gone by. The way we are going we cannot take it for granted that in future sufficient heating is always going to be available. You paint such a vivid picture, Uta, of a world and way of life that has disappeared completely, and although it was such a difficult time in so many ways, especially for the adults, you evoke a very beautiful child’s world with warmth and love and happiness. Thank you for these memories and the photograph. We had a bathroom, but the only heating was from the coal fire in the living room, so as a child I too had a tin bath on the hearth because the bathroom was freezing in winter! Submitted on 2014/12/06 at 5:44 pm | In reply to Three Well Beings. Thank you, Debra. Well, I believe Tante Ilse really loved Onkel Peter very much. She was always friendly and polite towards W.M. but it would not have been a love match. We were very fortunate that W.M. was such a generous person who did a lot for all of us during this trying period of World War Two. As far as I know he ended up losing everything after the war. Submitted on 2014/12/06 at 2:33 pm | In reply to gerard oosterman. Those memories are so well told and with the photo gives us insight in how it must have been from a young girl’s perspective. I can relate to the bath in the tub. Fortunately I was number 2 in line so the water was still reasonably clean and warm. Mum doted on me. I was her first born child. I am sure I got a lot of attention during the first years of my life, and not just from Mum, but also from her sister who had no children of her own. Later on I realised that my mother would very much have loved to have a daughter in her image. What a disappointment it must have been for her that I was in a lot of ways the exact opposite of her! I think I wished to be a boy. Girlish things just did not interest me one bit! Mum promised her sister, she’d fly to Westerland the same day. She was quite excited about this. In her excitement she forgot to ring Dad’s office to let him know about her plans. Or did she deliberately not ring him because she sensed that he would have objections to her leaving us children in the care of our home-help! I remember when Dad came home he was furious when he found out that Mum had taken off to join her sister and left us children in the care of our eighteen year old home-help! I believe Mum stayed in Westerland for a whole week. When she returned, she talked excitedly about how she had been spending time with her sister in Westerland. Come night-time they waited till Aunty’s mother-in-law was fast asleep, pretending they were going to sleep too. However as soon as they thought the old lady was fast asleep, they escaped through their bedroom window and went dancing. I remember seeing pictures of them that were taken on the dance-floor. They had already acquired a nice brown tan from having spent time on the beach. I remember looking at the photos and seeing how very brown their faces looked in sharp contrast to their white dresses. Two young marine officers, smartly dressed in their uniforms, could be seen with them. Later I found out, that one of the officers was Helmut Lorenz who five years later became Aunty’s second husband after her divorce from the first one. And the other officer was no other than Max Tomscick, who after the war became Mum’s friend and whom she would call ‘Bambie’. If I’m right that this holidaying on the isle of Sylt took place during the first half of August 1939 this would mean that just a few weeks later, on the first of September, Germany was at war and the above mentioned young navy pilots would immediately have been on call for they were officers in the German Navy. I cannot recall that having to stay without Mum for a week did cause us any hardship. So the young home-help must have coped quite adequately. Something else comes to mind. When Baby Brother Bodo was nearly a year old, he had developed an allergy to cow’s milk. He was not allowed to drink milk then. However when he was a bit older, he could drink milk again. Peter Uwe, Mum’s third child, was born on the 28th of October 1941. We had a twenty year old Polish maid at the time, who soon cared for the new baby as though he was her own. She became his ‘Dada’. She was the main contact person for the first three years of his life. This second brother became a very happy and contented child, whereas the first brother was always highly sensitive and suffering from asthma throughout most of his childhood. Dad, when he was around, would pay a lot of attention to us children. When Bodo had one of his awful asthma attacks Mum would always be very concerned and tirelessly look after him. 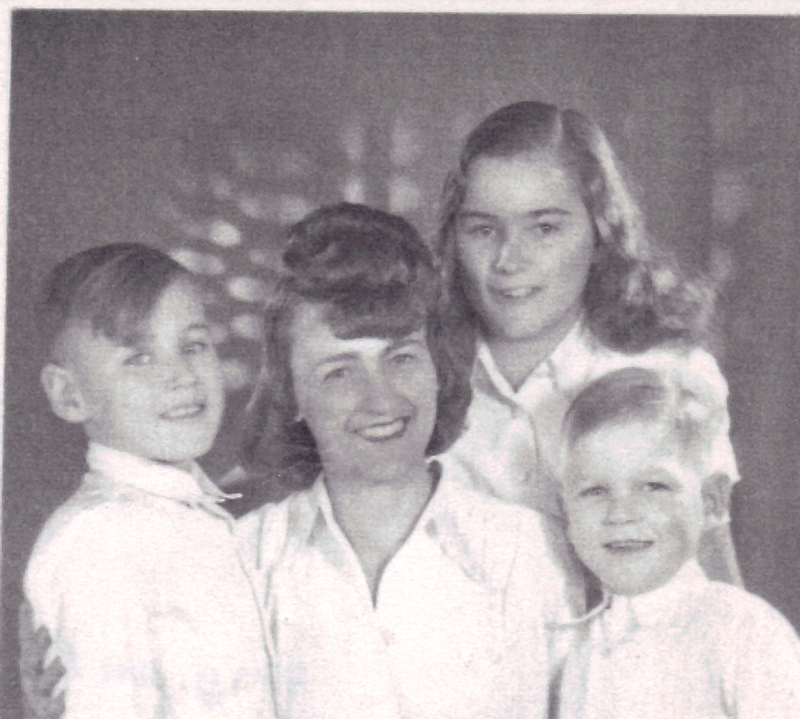 The photo shows Mum with us three children in 1948. This is a pass-port photo of Maria. Instead of having every Wednesday afternoon off, Maria had every second Wednesday the whole day off. That made it possible for her to go on the long journey to Berlin to see her butcher friend to whom she was engaged. When she came back, she always carried a large packet of smallgoods (wurst). There was liverwurst and salami and Berliner fleischswurst as well as frankfurts and ham. That Maria was willing to share all this with us, certainly shows that she must have regarded us very much as her family. Mum enjoyed to go to Berlin once a week. She stayed in our city apartment, which we were still renting, even though there was hardly any furniture left in it. Eventually Mum had to take in several ‘Untermieter’ (sub-tenants). That is some rooms had to be sublet to people who had lost their homes during some bomb raids. Towards the end of 1944 Mum was only left with one room to herself. None the less, she liked the excitement of being in Berlin. I can’t recall Aunty Ilse ever going to Berlin. She did not have an apartment to go to any more, since the top floor where her apartment had been, had been totally destroyed by fire-bombs. Submitted on 2013/05/28 at 7:30 pm | In reply to The Emu. Thanks, dear Emu, for this comment. Yes, maybe she married and raised a family. I like to think that she did. Is she still alive now? Maybe she is and maybe she isn’t. She would be well into her nineties now. I do not recall her surname and I have no idea what the butchers name was. We often talked about her with my brother Peter. He knows that she looked after him a lot during his early years. But he was too little to really remember her now. But he’s always interested to hear more about Maria. He knows of course that she was Polish. That reminds me once, when we were visiting my brother, when he still lived in Berlin, he had a young Polish woman coming to Berlin from Poland for a few days every week to do some apartment-cleaning jobs not just for my brother but for other people as well. With the money she earned she could do a lot of things in Poland, for the German money was worth considerable more than Polish money. She was polite, respectful, well spoken – she reminded me a bit of Maria. This goes back now more than eighteen years. Her husband in Poland was a tennis instructor. For his efforts he earned in Poland far less than what his wife could earn in Germany doing some cleaning jobs! Even when you consider she had expenses travelling on the train it was still very much worth it for her to do this job for a while. Maria sounds like a very lovely and generous girl, it would be lovely to be able to follow up on her life and everything that occurred after the war, did she marry the butcher and raise a family? Submitted on 2013/05/26 at 7:01 am | In reply to WordsFallFromMyEyes. Great question, Noeleen. Lots of children didn’t live in their hometowns any more anyway. They had been evacuated to far away places, for instance Peter’s two sisters and later Peter as well lived far away from Berlin. Whereas their Mum and Tante Mietze stayed in Berlin. Each of these city houses would have had strongly built basements and cellars underneath. Often people could survive in these cellars and even live in them for a while if the apartment house had been destroyed by bombs. The buildings that were left standing would have been occupied by lots of additional people. Whoever didn’t need to stay in the cities escaped to somewhere in the country. What on earth happened to people when their apartment was bombed?? Where ever did they go. War is so far reaching. The other day we looked into a shop through a window. I noticed these tops. I believe they are called humming tops? I could not help myself, I had to take a picture of them. They reminded me so much of my childhood. Gee, did I love these tops as a kid! My humming top was probably one of my favourite toys. And I knew other kids who owned humming tops. Whenever I visited a friend with a humming top I would try out what kind of humming noise their top did make. This was so exciting! My friend Eva, who was a bit younger than I was, had lots and lots of children’s picture books. I loved to have a look at all her books! Of course, I had a few picture books myself. However, I am sure Eva had many more than I had. So it was always a pleasure to go visiting her. Eva had a large play-room all to herself, whereas I had to share my room with my little brother, who was about two when I was five or six. I was allowed to go across the road all by myself to visit Eva. I believe I had instructions to return home straight away if for some reason I could not stay at Eva’s. When I rang the bell at the door to their flat, it was usually the maid who opened the door. My standard question was: “Guten Tag, can I play with Eva, please?” And then the maid would let me in and I’d join Eva in her room. Eva’s Mum usually came to Eva’s room to say hello and talk to us for a while. Over the years I did get to know their whole apartment. I still know where all their rooms were. But for playing we always stayed in Eva’s Kinderzimmer. Other friends I visited in the neighbourhood were Siglinde in number 4, Gunhild in number 18 and Rosmarie who had a younger sister called Gudrun in number 19. I knew all these friends before I started school. With all these friends and some boys as well we often played ball games and hide and seek and some singing games in our secluded street. This was a time when there were not many cars around. I cannot remember any cars ever going through our little street. Tante Ilse and Onkel Addi owned a car since 1938, the year my brother Bodo was born. They rented a garage for their car some distance away. These days the street is full of parked cars. No children play in the street any more. 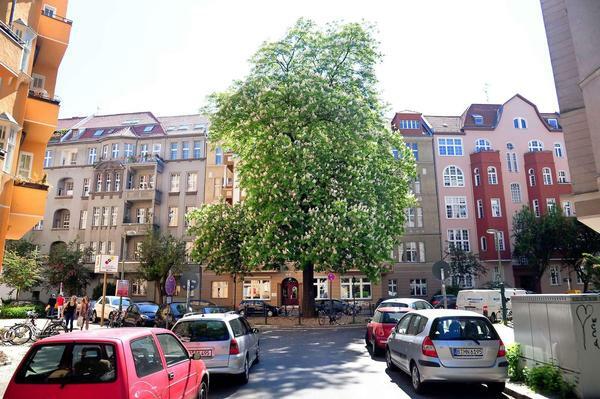 I remember reading in a Berlin newspaper recently that your street is one of the most beautiful streets in Berlin. The chestnut tree at the end of street is really a landmark. We used to live in the orange building building for about ten month in 1957 with Baby Gaby. In 1957 the building had not turned orange yet! What lovely memories can be evoked by something very simple! 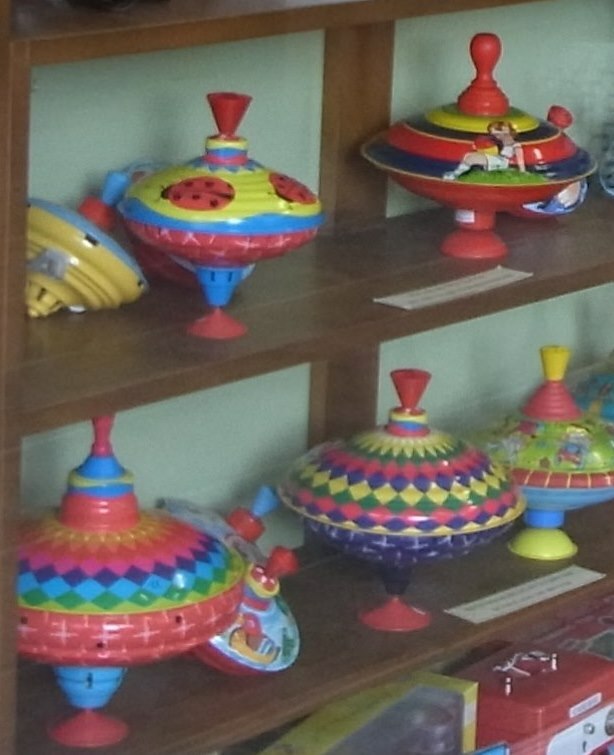 I also loved humming tops but never had one of my own. Your friends had such pretty names, too – you don’t hear little German girls called by those names any more. Happy reminiscing! Thanks, Cat. I always love your comments. Thinking of names, Gudrun comes to mind. Our best friends’ daughter was called Gudrun. She was born in 1957, the same year that our daughter Gabriele (Gaby) was born. Those really are beautiful. I do actually remember seeing them as a kid, but I don’t think I ever had one. There is nostalgia for the past, I think. People perceive the past to be a sweeter and easier time. You know that is not really true, but let them think…. Humming tops bring back many enjoyable memories Auntyuta. So simple and yet fun to play with, pity the younger generation cannot see the simplistic beauty and joy in such a lovely toy. Before and after the War, a Reblog. When I was about thirteen, Cousin Sigrid made a remark, that put a damper on my wishful thinking. Sigrid had noticed, that I got very good marks in high-school. So she said in a quite friendly way: ‘I see, you’ll probably end up becoming a Fräulein Doctor!’ This remark made me furious inside. It sounded to me, that once I embarked on becoming a ‘Fräulein Doctor’ I would have no hope in the world of acquiring a husband and children. ‘Who in their right mind would study to achieve a doctorate and miss out on having a husband and children?’ I thought to myself. Thanks for sharing these. Something I can relate too. I wasn’t comfortable in high school. Shy, lacking confidence, felt a bit out of place but in college I got my groove on and been doing okay since then. I learned that with the right friends and family, we bloom into something amazing. Have a blessed day my friend. Interesting look into your past Uta , I can relate to the feeling of being a plain Jayne..very shy to. Thank you for sharing today. I am amazed that in 1942 you had dreams of going to University. You are about the same age as my mother and, even though she is highly intelligent, I do not think that she ever had dreams of attending University simply because (here in Australia) at that time one could only attend University if from a very wealthy family. So it was never even contemplated by those of low or average means. Hi, Elizabeth, thanks for commenting. We probably had a bit above average means at the time. Both my father and one of his brothers had a doctorate. My mother left school at fourteen. But this did not mean that I could not make it to university, so everyone thought. Over the years here in Australia we made friends with two highly intelligent people who were both a bit older than Peter and I and had never attended university having been from a rather poor background. But they were both well spoken and interested in writing. My grandfather had been in a position to be able to pay for his sons university education in Leipzig from about 1925 to 1930. According to my father, both he and his brother lived a frugal life as students. As far as I know they never did any jobs to earn money during their university years. How times have changed. Now everyone seems to have the opportunity to go to University. This is a good thing. Du hast recht, lieber Klaus, man sollte sich Zeit zum Lachen nehmen. Lachen ist sehr gesund, nicht wahr? Und zu egoistisch zu sein, nein, das bringt nichts ein! So hoffe ich, dass du auch viel Freude am Leben hast. Herzliche Grüsse von Uta aus Australien.